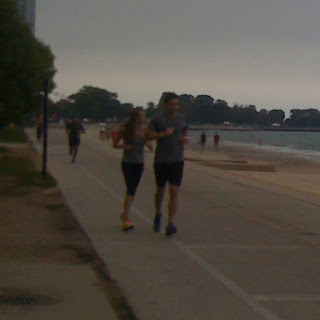 Can you guess who I saw running on the Lakefront Path yesterday? Considering this is a picture from behind and it's blurry, here's a clue, and one that practically gives away the answer if you're reading a little too much at people.com and E!Online. This celebrity couple shared some exciting news earlier in the week--they became parents! So who is this running duo that I initially spotted around Fullerton and caught up with near Goethe? It's Bill and Giuliana Rancic. I might have missed Ryan Lochte's appearance at Sunda (still jealous that a fellow FFCheer member got a picture with the swimmer), but spotting the Rancics easily made up for it. 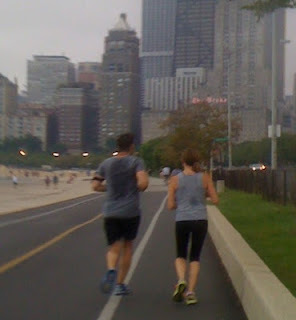 They were out enjoying, or maybe slogging through would be a better way to put it given the humidity and unappealing grey sky, a run like any couple might on a Saturday morning. I was probably the only person obnoxious enough to snap pictures of them doing so--though these blurry and not-as-close-as-I-thought iPhone shots prove I'll never have a career with the paparazzi. Either no one but me and the girl who shouted hello recognized them, or they were more polite to leave them be. And I hope they didn't turn off the path because of me. But I couldn't help but wonder how the Rancics have time to run now that they have a new baby? Maybe baby Edward was still with their gestational carrier in Colorado or being doted on by all the grandparents, aunts and uncles in the Windy City. Maybe I should have interrupted their run to ask. What do you think? Would you say hi to celebrities if you recognized them while running, or would you let them go incognito?